Electronic warfare hardware developed by the CSIR. The Council for Scientific and Industrial Research (CSIR) has displayed some of the innovative technologies being developed by its divisions, from unmanned aerial vehicles to gunshot and missile detection systems. The purpose of the event on 7 February was to showcase the latest defence and security related technologies that have reached advanced stages of technological maturity where further industrialisation can take place – the CSIR only develops but does not put technology into series production and is looking for others to fully develop and manufacture its technologies and systems. The CSIR hopes additional funding will come from such showcase days, allowing for further development. Various technologies were displayed to industry and the media at the CSIR campus in Pretoria, from aeronautics to radar and electronic warfare systems, optronic sensors and systems, and cybersecurity solutions. On the aeronautical side, the CSIR displayed its two unmanned aerial vehicles (UAVs) – the two metre wingspan Indiza with an endurance of an hour, and the eight hour endurance, twin-engine Long Endurance, Modular Unmanned Aerial Vehicle (LEMU). Indiza is in production for a customer while the LEMU is still under development, with numerous engine options being developed. Also on the aeronautical side, the CSIR showcased its small 100 kg thrust class gas turbine engine for applications such as stand-off weapons. Trial manufacture has started to establish a reliable supply chain and advanced manufacturing base. Hanging from the rafters at the CSIR’s Building 44 was its novel active aerostat, which is able to lift heavier payloads and better maintain its position in high winds compared to conventional aerostats. The helium-filled aerostat does this through its wing-shaped configuration with active control surfaces. On the electronics side the CSIR showcased its digital radio frequency memory (DRFM) devices that generate jamming waveforms. The DRFM receives a radio frequency emission emanating from a threat radar, then modulates the signal, returning a delayed version to the radar to jam or spoof it. The DRFM forms a core of the Electronic Warfare Environment Simulator Systems the CSIR develops to test radar and electronic systems. The CSIR’s Inundu airborne pod is also used for electronic warfare testing and evaluation. It can simulate anti-ship missiles in air-to-surface combat, as well as air-to-air. It is platform agnostic, but has been flown on the Denel Cheetah, Hawker Hunter and BAE Systems Hawk. Other simulation technology includes the Dynamic Scenario Planner, a software application for the setup, planning and visualisation of simulated scenarios; and the Radar Environment Simulator Test and Evaluation System, which tests radar systems. The CSIR’s Sensors and Electronic Warfare Engagement Simulation (SEWES) system simulates an environment with any number of platforms, sensors and electronic warfare systems. It is used to test electronic warfare effectiveness, doctrine and training. Several hardware items were on display, including the Otus 10 km range camera that is being used to detect animal poachers as part of the Meerkat wide area surveillance system that adds a Reutech radar. Tyto is an affordable, 5 km range variant of the Otus camera that is smaller and lighter and applicable for infrastructure security, amongst other uses. A relatively new item of technology is a unique gunshot and missile launch detection system. Unlike most conventional gunshot detection systems which rely on acoustic sensors, the CSIR system uses infrared sensors to detect when a firearm is discharged or a rocket motor launched. For many years the CSIR has been developing passive radar and it continues to develop this technology, with multiple nodes installed at five sites around the country. Passive radar, also called passive coherent location radar, uses third party illuminators like FM radio to locate and track targets. As such, it does not emit any signals and is very difficult to detect. Another detection/surveillance technology on display was a Wide Area Surveillance System that provides a 360 degree view around a vehicle plus the locations of threats/targets whilst personnel stay safely inside the vehicle. It can be used day or night, on land or at sea and is based on proprietary calibration techniques and stitching algorithms to fuse data. The CSIR has developed a system for the detection of explosions, such as landmines or improvised explosive devices, and which then triggers an active mitigation system to neutralise the detonation. It can be fitted onto armoured vehicles. According to the CSIR, there is no similar detection system in the world today. Other technologies on display included add-on protection packages for vehicles to protect against explosive attacks; a deflection gauge to measure the response of materials to explosive blasts or ballistic impact; and the Cmore domain awareness system that integrates information from various sensors into one display that allows the commander to form a picture of what is really happening. 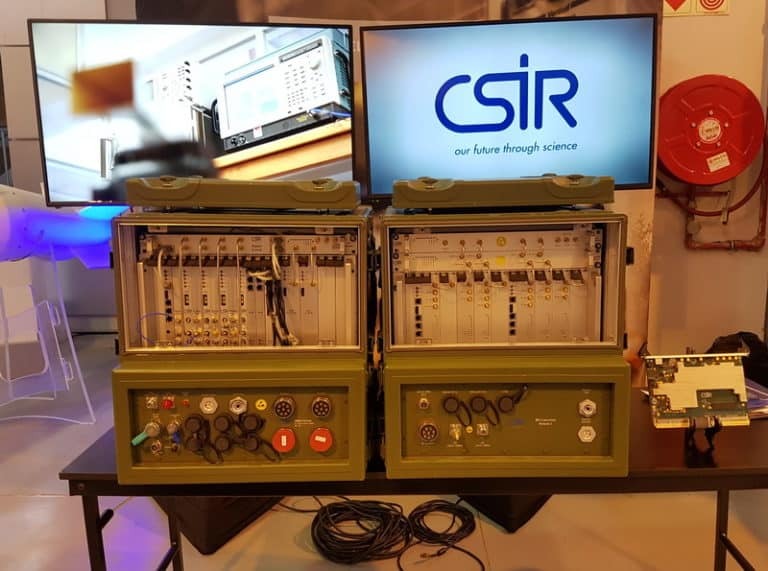 On the cyber front, the CSIR showcased its Network Emulation and Simulation Laboratory (NESL), which replicates existing or planned networks via physical and virtual devices to test a network. It can simulate cyber security incidents like denial of service attacks or ransomware. Similarly, the Cyber Vulnerability Detection System is used to monitor the cyber landscapes of organisations, regions or nations and detect vulnerabilities within connected devices. The Cyber Test Range is another network simulation system where hardware and software behaviour is analysed and vulnerabilities exposed. It can be used for training and as a testbed for cyber experts.